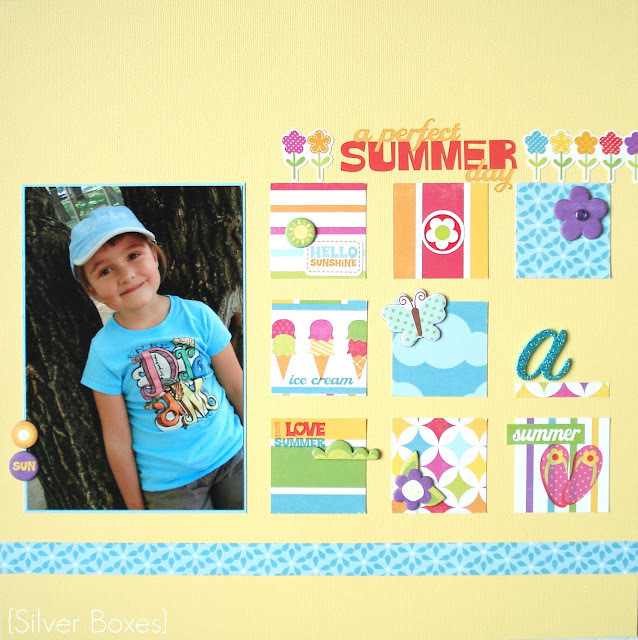 Silver Boxes: Summer Days Layouts / 100 followers! Summer Days Layouts / 100 followers! Are you dreaming of spring & summer as much as I? Even though it's still winter I'm enjoying planning for the warm weather ahead. Getting ideas for the garden, planning our spring cleaning & summer vacation, and doing some projects & crafts that remind me of summer. Part of that includes working on scrapbooking this past summer's photos. I'm almost done! I've found that since I've started this blog, I'm taking many more pictures of stuff than of the people in my life... bad mommy!! :) I've resolved to change that & return to taking more pictures of the everyday moments in our lives. I got a nice opportunity this weekend when we went ice skating as a family. The outdoor rink is in a lovely little spot right downtown beside the river. It was just beautiful & it was our daughter's first time on skates. Fun! Back to the point... scrapbook layouts. Here are two that I created using Echo Park's Summer Days line. I originally bought this line thinking I'd save it for this year's summer vacation but those bright colours & fun patterns won me over sooner than I planned. This line is so colourful & just plain happy! I can't wait to use it for all the fun photos we capture this summer! This weekend, Silver Boxes reached 100 followers!! It's been a very exciting weekend for me. When I started SB & after perusing many other blogs, I thought it would take at least a year to reach 100 followers. Here I am, 6 months into blogging & I'm astounded that I've already reached that milestone. I want to thank you for you continued support & kind words. I appreciate you all! AND...welcome to my new friends! I look forward to getting to know you in the coming months. yay! Congrats on the 100 followers! I was glad to be one! Nice layouts too!